This amazing, durable, expensive, safe Garlando G-5000 table is mainly made for teenagers, adults and intermediate players. It’s really sustainable and of high quality, built to last. And in case something does break, you always have a three-year warranty, while others of lower quality often come with a 90-day warranty. In fact, the Garlando G-500 table is our #4 choice in our list of best tables overall, and this one is even more sturdy, so you can be sure it’s an excellent table. 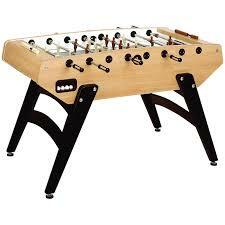 The Garlando G-5000 Foosball table’s length is 56 inches, its width is 30 inches, and its height is 35 inches. It weighs 165 pounds, which makes it quite sturdy, though lighter than other high end tables that are usually around 200 pounds. We can judge the quality of the tables from their thickness. So let me tell you that the tables of low quality tend to be less than half an inch thick but this table is 1-inch thick which provides sturdiness, durability and also safety so obviously, it is more expensive than others of lower quality. The ball-bearing is encased in nylon and the legs are covered with washable powder varnish for greater protection. Not only is it excellent for smooth gameplay to have ball bearings, but the extra details on the legs help it to maintain it’s high quality year after year, even after heavy use. It has coldly drawn steel rods that are the best you can get as they are strong, straight, and plated with five microns of anti-rust chromium for greater durability. They’re also made in a telescope-like shape in order not to come out on the other side, which provides safety, a key feature of high end tables. It’s provided with angled corners and panels on the side to keep the ball moving, and the wood handles reduce sweating. The only down side that stopped this from making our overall list of the best tables is that it does not have counterbalanced men, which all tables at this price point should have. This table has a butcher-block light wood cabinet which gives it a traditional look and fits the black legs well. The red and white players are classy and provide a high quality feel to the table overall. There is a green tempered glass surface that looks great (and provides amazingly smooth and fast play) but the white corners stand out so much which takes away from the great appearance and aesthetics. So far, all the reviews are positive due to the durability, gameplay, and safety for kids (telescoping rods). Although it lacks counterbalanced players so the players don’t stay in the same position that you last left them. It still has an attractive design and if you’re not a pro, it should be worth the money, even without the counterweighted men. It’s true that you can find a variety of tables in the market but if you are searching for a long term, safe, bearing and durable foosball table, you should consider choosing the Garlando G-5000 soccer foosball table.